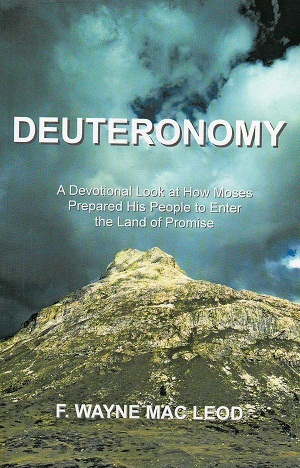 As we begin the book of Deuteronomy, Moses is speaking to the Israelites. They were on the eastern side of the Jordan River (verse 1) and had not yet entered the Promised Land. It was the first day of the eleventh month, forty years after they had left Egypt (verse 3). God had given them victory over the Sihon, king of the Amorites and Og, king of Bashan on the east side of the Jordan. Now they were preparing to cross the river into the land of Canaan. As Moses speaks, he takes his people back in time to the region of Horeb at the foot of Mount Sinai (verse 6). It was at Mount Sinai that God gave His commandments to the Israelites. Here they learned what God expected of them and His requirements for their lives. Of particular concern to Moses, however, was the time when God told the people to break camp and advance into the territory of the Amorites. God promised to give this land to them. All they had to do was take possession of it (verses 7-8). Notice that in the mind of God the victory was already accomplished. It was His will that the Israelites have the land of the Amorites. The property title had been signed by God and it now legally belonged to them. All that was required was for them to enter and take possession of the land. Admittedly, this would not be easy. There were people living there who did not want to leave. These nations, however, had corrupted the land by their false religions and evil practices and it was God’s intention that they be removed. Notice from verse 9 that Moses felt the immensity of the task before him. Leading this nation and helping them settle in the land God had given them was a burden too heavy for him to carry alone. He proposed that the Israelites choose wise, understanding and respected men from their tribes who would be given responsibility to make decisions regarding the disputes that arose among them (verse 12). We understand from this that if the people of God were to take possession of the land God had given them; they needed leaders to guide them into this victory. These leaders would be responsible before God to deal with any problems that arose as they moved forward. They would promote harmony and unity among the people so that they could focus on the task at hand. Consider this for a moment. One of the great struggles of the body of Christ today is dealing with problems among its members. God has called us to possess a land currently held by Satan but we are so busy trying to deal with problems among ourselves that we cannot advance. As long as we are fighting each other, we will never be able to possess the land God has given us. One of the great responsibilities of Christian leaders today is to encourage unity in the body of Christ so we can move forward. Moses understood that if the Israelites were going to posses the land God had given them, they would first need to deal with the divisions and disputes among themselves. For this reason, he sought the Lord about finding godly men who could help deal with the issues that arose among God’s people. The challenge of Moses to find leaders pleased the people (verse 14). This resulted in respected men being appointed and given authority over thousands, hundreds, fifties and tens (verse 15). The context indicates that these men had different responsibilities. Some were to be military commanders. Others were to be judges to settle disputes. Of particular concern were those who had been given the responsibility to judge disputes between brothers and sisters. Moses challenged these men to judge fairly and not to show favouritism. These judges were not to be afraid of what people might think. Any case that was too difficult was to be referred to Moses who would seek the Lord’s decision (verses 16-17). When their leaders were in place, the Lord commanded His people to leave Horeb and go toward the land of the Amorites, which meant passing through a “dreadful desert” (verse 19). The way to victory comes through struggle. Victory will not come without effort or pain. We will face the desert of discouragement or pass through the wilderness of rejection. There will be a cost to pay for victory but the joy of success will be worth it all. In the region of Kadesh Barnea, in the hill country of the Amorites, Moses reassured his people of the promise of God to give them victory. He challenged them to take possession of the land God had already given them. He told them not to be afraid or discouraged because God was with them and would assure their possession of the land (verses 19-21).